This short, wiry former song-and-dance man became one of the most significant of all British film stars, and in his nearly 60-year career appeared in well over a hundred films, as well as substantial theatre and TV performances. After training as a dancer, he was first on stage in the chorus of The Five O'Clock Revue (1929) and was regularly on the London stage, in revues, musicals and straight plays, throughout the 1930s, as well as making about twenty films before war broke out. He is an engaging juvenile lead in such 30s pieces as The Ghost Camera (d. Bernard Vorhaus, 1933, as Ida Lupino 's brother), the chirpy musical Car of Dreams (d. Graham Cutts, 1935), the love interest for Nova Pilbeam 's Tudor Rose (d. Robert Stevenson, 1936), and the schoolboy grown into soldier in Goodbye, Mr Chips (d. Sam Wood, 1939). But World War II changed everything for Mills , as it did for so much connected with British cinema. The roles he played in In Which We Serve (d. Noël Coward/David Lean, 1942), We Dive at Dawn (d. Anthony Asquith, 1943), This Happy Breed (d. Lean, 1944), Waterloo Road (d. Sidney Gilliat, 1944) and The Way to the Stars (d. Asquith, 1945) defined a new kind of British film hero: he is the boy-next-door in his ordinariness, but he has also established an everyman reliability under stress; he is decent, brave and loyal; and he works enough subtle mutations on the type to avoid mere repetition. It is arguable that no British male star ever had so long and rewarding a stardom, and in predominantly British films. In the postwar era, he was a definitive Pip in Great Expectations (d. David Lean, 1946), emphatically a figure for a supposedly more egalitarian Britain; the tormented hero, an industrial chemist who fears he may have committed murder, in The October Man (d. Roy Ward Baker, 1947); the archetypal British hero, Scott of the Antarctic (d. Charles Frend, 1948), who failed so bravely; and another sort of hero, the bootmaker Willie Mossop, in Hobson's Choice (d. David Lean, 1953). As the 1950s wore on, the roles shaded subtly into character leads. 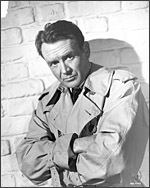 He is the shabby private detective in The End of the Affair (d. Edward Dmytryk, 1954) and the captain in Ice Cold in Alex (d. J. Lee Thompson, 1958), pushed by exhaustion into incipient neurosis and alcoholism. The twitchy, repressed military types in Tunes of Glory (d. Ronald Neame, 1960) and Tiara Tahiti (d. Ted Kotcheff, 1962), the one headed for tragedy, the latter for the humiliations of social comedy, reveal precision as well as versatility; and he is ultimately very moving as the father in The Family Way (d. Boulting Brothers, 1966) who may have loved no one as much as his dead mate. Typically, he got the Oscar for a grotesque piece of facial and vocal distortion in the inflated Ryan's Daughter (d. David Lean, 1970) - supporting actor Oscars have always been drawn to this sort of cosmetic display - when one could nominate a dozen far less showy, more worthy contenders among his roles. Even in perfectly ordinary films like The Vicious Circle (d. Gerald Thomas, 1957), one never stops believing in him. His later decades saw him in character cameos, in good films (e.g., Gandhi (d. Richard Attenborough, 1982)) and bad (e.g., Deadly Advice (d. Mandie Fletcher, 1994)). Kenneth Branagh enlisted him (as whom did he not?) for Hamlet (UK/US, 1996) to play the mute role of "Old Norway", for whom Shakespeare had thoughtlessly failed to produce lines, and he went on appearing in TV series (e.g., Martin Chuzzlewit , BBC, 1994) and talk shows. Though very deaf and part-blind, he still evinced the chipper persona honed below (occasionally above) decks in those war films half a century earlier. He tried his hand at directing and producing but he is, above all, a British film actor par excellence. The achievement is there in the CV; it has been recognised serially with CBE (1960), knighthood (1976), BAFTA Special Tribute Award (1987), and BFI Fellowship (1995). No one could say he hadn't earned them. Married (his second) since 1941 to author Mary Hayley Bell , he is the father of actresses Hayley and Juliet Mills. Autobiography: Up in the Clouds, Gentlemen Please (1980).